(Courthouse News) Dam operators will send more water spilling over the eight dams along the Snake and Columbia rivers in an effort to help young salmon survive the notoriously deadly trip to the Pacific Ocean. The spill management plan for 2019 and 2020 is a win for salmon advocates in a 17-year legal battle where federal judges have repeatedly told the government it’s not doing enough to prevent the extinction of salmon in the rivers of the Northwest. It also brings that litigation into alignment with the work of a Washington state task force determined to prevent the extinction of Southern resident killer whales whose survival depends on endangered Chinook salmon. In a May 2016 ruling, U.S. District Judge Michael Simon sent the government back to the drawing board for the fourth time to develop an effective plan to help fish survive the gauntlet of dams between the rivers where they hatch and return to spawn, and the ocean where they live most of their lives. This time, Simon said, the government had to consider every reasonable method to protect fish – including the removal of the four dams along the Snake River. Spill opponents like the Columbia-Snake River Irrigators Association and Northwest RiverPartners, a coalition of farmers and industrial interests that depend on irrigation water from the dams’ reservoirs, argued increasing spill costs dam operators by spilling water that could have instead run through dam turbines to create electricity. They also said spilling more water could even imperil young fish, by increasing the amount of dissolved oxygen to the point where fish essentially get the bends. But the science is clear that sending more water over dams helps salmon – as long as the total amount of dissolved gasses is kept within certain levels. Too much gas in the water can be harmful, but in general more water flowing over dams will provide better conditions fish recovery, according to Kurt Beardslee, executive director for the Wild Fish Conservancy. The Army Corps of Engineers operates a series of eight dams on the lower Columbia and Snake rivers that affect the habitat and migration of anadromous salmon and steelhead species. These are Bonneville, The Dalles, John Day and McNary on the lower Columbia; and Ice Harbor, Lower Monumental, Little Goose and Lower Granite on the lower Snake River. The dams impede juvenile and adult migrations to and from the ocean by their physical presence and by creating reservoirs. In Montana at the upper end of the Columbia Basin hydroelectric system, Hungry Horse Dam already spills more water each year to aid in the salmon migration. Meanwhile in Washington state, the Southern Resident Killer Whales Task Force recommended to Gov. Jay Inslee in November that dams along the Columbia and Snake Rivers be given the flexibility to periodically increase spill to allow the total amount of dissolved gasses to reach 125 percent of saturation. The state’s Department of Ecology is expected to announce a temporary rule to allow spill to increase to that level. 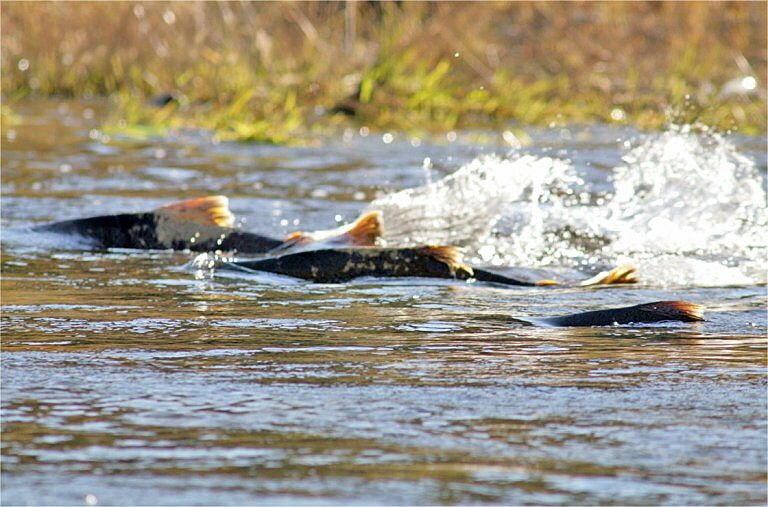 The new agreement, released Tuesday, is designed to protect salmon, not orca. But it would increase the gas cap, or upper limit of total dissolved gasses, at the eight dams in the Federal Columbia River Power System to the 125 percent recommended by the orca task force. Fish survival is not the only thing the agreement aims to protect. It also includes provisions to safeguard Bonneville Power Administration’s bottom line. Dam operators may not spill so much water that Bonneville’s income drops below the amount it made this year, the agreement states. And the parties – including Bonneville, the National Wildlife Federation, the Nez Perce Tribe, the U.S. Army Corps of Engineers, the U.S. Bureau of Reclamation, and the states of Oregon and Washington – can’t sue or seek declaratory or injunctive relief over the matter until the two-year agreement ends. Political maneuverings aside, Beardslee said all increases in spill are a good thing for fish recovery.